The last episode of the infamous Free! 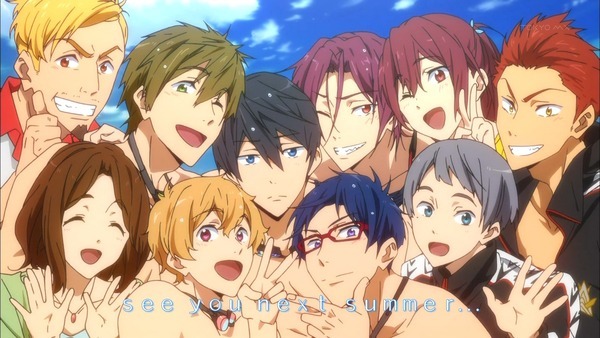 anime series ended with a clear message – we will see it again next summer! Whether it will be a new series (which all of its fans are hoping to be the format) or a movie, it is still unconfirmed, but there is no doubt that Iwatobi Swim Club will be back. Free! began in July this year and managed to quickly turn into an explosion. This show was rapidly embraced by almost every female anime viewer because of its beautiful male characters and cheeky situations. One thing is sure, Free! turned into a phenomenon and will bring about many more that will try to copy its fame and fortune. Thankfully, before we get spammed by copycats, the original show will once again show up on our screens – in the summer of 2014. Also, I think this is the place to note that I am open for reviews, feedback and previews written by any otaku in the world – just email or message me on Facebook, Google+ or Twitter if you can’t find out my email address. I loved this ep I’m so happy there will be another season I am definitely an otaku. Please support FREE so we can all see another season please let me know any updates thanks!